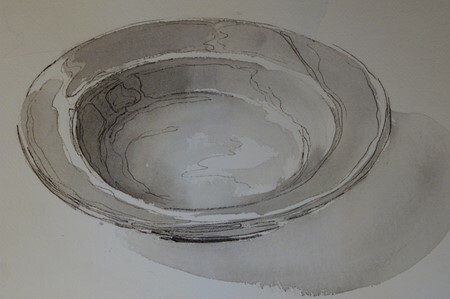 According to most dictionaries a bowl is a round container, wider than it is deep and holds foods or fluids….That is apart from all the other meanings…shapes, sports, etc. So I took to searching my house for bowls. There are many. But then I also found other “containers” which I find have no boundaries in terms of their function. I often use this big platter for meat dishes, salads, but I have also used it as a bowl, since it is just deep enough to prevent sauces from dripping over the sides…platter…or bowl? Next I thought of, was my mother’s silver sugar container, I now use as a spoonholder. Since I grew up never asking :” Please pass the sugarpot/caddy/bowl”, but simply: “Pass the sugar”, I still don’t know what it really is, and should I now maybe ask to be passed the spoonbowl? The third find in my home was the bird bath. Although it is frequented now by the birds for bathing and our cats for drinking, it did in its newly bought years serve us humans of the house well as a fruit bowl al fresco style. 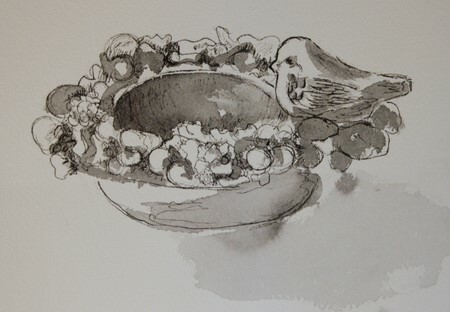 Birdbath, spoonholder, platter, bowl…it is all in the eye of the beholder. Very nice line and wash, Ronell! These are really nice! Great job! Really nice bowls! You did a great on all the bowls. osh these are good but I especially love the top one. It’s funny how you can see the skill involved more clearly in the most simple of images. Gorgeous. What medium did you use? These are so beautiful- nice work! Nicely done! They are all lovely but my favorite is the third one. Thank you for all the wonderful comments..
Andrea, my mediums were pen and just plain old black watercolor. wow, you’ve been busy! I love these ink and wash drawings you’ve been doing – I agree with Andrea – they’re all really good, but the first one is a stunner! These are all beautiful! It’s amazing what can be done with variations of just one color. GORGEOUS! Those washes are just scrumptiously done!! BRAVA! Thanks again for the encouraging comments…they really inspire me to keep working at it! Your use of wash is just magical! Thank you, Deb…”magical” does make my heart go completely wild! 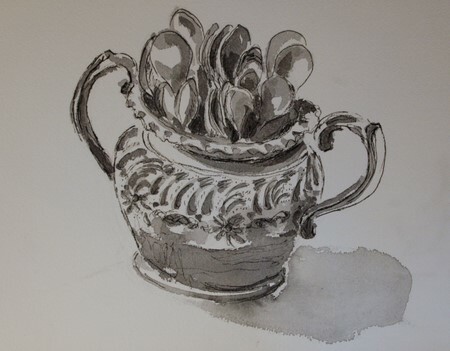 I just love this sketch of the spoon bowl-beautiful. I have one too sitting on my table filled with silver spoons we use every day.